A Florida father has been charged with felony battery after allegedly flying into a rage on the sidelines of a soccer game and attacking his daughter's coach. 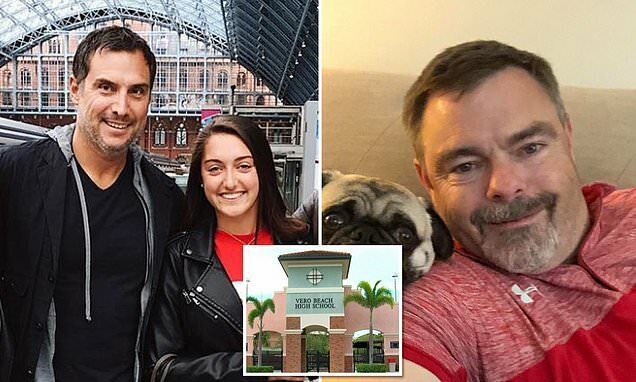 Anthony D’Elia, 42, was arrested after the February 12 incident that occurred after the Citrus Bowl playoff game between his daughter Brie's Vero Beach High School team and the visiting squad from Boca Raton, Florida. Indian River sheriff's deputies said D'Elia slapped Vero Beach coach Dan Dickens’ cell phone out of the coach's right hand during a confrontation after the game. The smack reportedly sent Dickens' phone flying 40 feet over a fence and into the stadium's north bleachers. D'Elia was furious because Dickens had yelled at Brie, a senior who plays left wing, before taking her out of the game. She later cried in her dad's car. Coach Dickens reportedly grew frustrated with Brie during the last few minutes of the game in which she'd played the entire time up until that point. 'You aren’t listening to me!' Dickens reportedly said to Brie on the sidelines, according to the TC Palm. 'I haven’t listened to you all game and we are winning,’ she replied before the coach told her to take a seat on the bench and turn in her jersey.